Pick up your application at Step by Step Child and Family Center Reception, submit their letter of intent, updated CV/Resume, name and contact info for 2 references and signed privacy waiver with a photo ID. Niawenkó:wa to the Community Initiatives Fund for providing monies which will allow us to structure our future funding initiatives and efforts. On behalf of the children, families, Board of Directors and staff of Step by Step Child and Family Center we would like to express our gratitude for this opportunity and generosity. Get the current facts about using cannabis for non-medical purposes while parenting young children. Click on the link below for more information. We are very pleased to inform you that one of our parents has taken the time to create a beautiful painting on one of the outdoor tables in recognition of the Caisse Populaire Kahnawake and HeadStart Program. Our staff look forward to hosting events in this natural classroom by inviting parents and the members of the community, to build, and learn with their children play in the mud and water. In this way, Tsi ne ionterohwaienhstakwa Kahwatsiranó:ron Step By Step Child and Family Center intends to commemorate your contribution to for years to come. On behalf of the children, families and staff of Step by Step Child and Family Center, we would like to sincerely thank you for all that you and your team has done in reaching our goals of providing our children with a safe environment. Are you an outdoor fan? You should know that mosquitoes are not the only insects that can make your life difficult! Beware of tick bites that can transmit Lyme disease, a disease that can lead to complications if it is not detected in time. The best way to prevent Lyme Disease is to protect yourself from tick bites. - Shower or take a bath within two hours of being outdoors to wash away loose ticks. - Download the Lyme disease toolkit. Step By Step doesn't consider the end of the school year as an "end". Children leave but are always considered family at SBS. Some children return for the summer, some the following year as an older sibling of a younger child enrolled at SBS. Sometimes, we've seen them come back as parents themselves. The "end" of the school year is about children and families celebrating this new relationship with the Center and the journey ahead of them. Our Leaving Ceremony and Family Picnic, which were held on June 21st are a part of that celebration. We also celebrated the wonderful goodness of strawberries at our Strawberry Social which we held in our front yard on June 20th. And finally, the love of music and sounds was celebrated on June 17th at our final Activity Day of the year. Resource staff pulled it off again with creative ways to engage children with music and sound. A big thank you to Joe for his wonderful creations! Starting a new routine can be intimidating. For children and their families, starting daycare can be a little stressful. Surprisingly, most children adapt easily and fall into the routine of their new surroundings, new teachers and new friends. Welcome (back) to Step By Step! As recipients of the 2018 Tewatohnhi’saktha Business Golf Challenge, we would like to say niawenhkowa to everyone who contributed to the success of this annual fundraising golf tournament; the tournament organizers, sponsors and Caughnawaga Golf Club. We’d especially like to thank all of the artists, community members and businesses (local and non-local) who generously donated artwork, prizes, gift certificates and monetary donations to benefit our organizations. Our gratitude also extends to the golfers who participated, the auctioneer, MC and all volunteers from Kanien’kehá:ka Onkwawén:na Raotióhkwa Language and Cultural Center, Step by Step Child and Family Center and Tewatohnhi’saktha. Each and every one of you has contributed to the success of the 2018 Business Golf Challenge and we thank you for the generosity and support you’ve shown to our organizations. The proceeds from the tournament will assist us greatly in fulfilling our mission and goals. Check out our recent activities in our Photo and Video Gallery! Congratulations to all of our employees celebrating Years of Service in 2018/2019! Want more news about what's going on in Kahnawake? Click on the button below to view the Kahnawake Community Calendar. 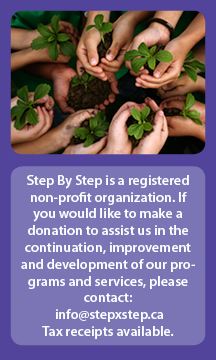 Please be advised that Step By Step is a Peanut and Nut free facility. We also practice Scent Awareness - due to respiratory sensitivities of staff and children, please refrain from wearing scented products (e.g. perfumes, colognes, lotions) while visiting or working at the Center.